At a major international tournament, the only thing that really matters is who takes the medals away from the event. In this regard, Team USA were the big winners at the 2014 FIBA World Cup, with the hot favourites for the tournament romping home in the manner that people believed they would. 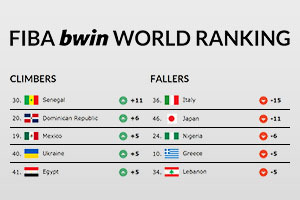 It is therefore no surprise to learn that the American side are still sitting at the top of the FIBA rankings after the Spanish event but there have been some changes to the top 10. Team USA currently hold 1,040 points and with Spain sitting in second place with just 705 points, it is likely that the American team will be holding their position for quite a while. Mind you, it is unlikely that Spain will be shifted from their second place position either. This is because the two teams below them sit on 455 and 447 points. The top four positions haven’t changed, so the top four teams, USA, Spain, Argentina and Lithuania are where they were before the tournament. USA finished first and Lithuania finished fourth, so these teams lived up to their rankings but of course, Argentina and Spain were let downs with respect to their rankings. In fifth place was the first real mover of the tournament and it is no surprise to learn that it was France. France finished third at the FIBA World Cup, taking home the bronze medal but they caused big waves by knocking out the host nation in the quarter final. This was a massive result for France, it was probably the biggest result of the tournament and it meant that the expected final of USA versus Spain didn’t take place. In finishing third, France managed to jump three places, edging ahead of Russia. France have a total of 360 points in fifth place while Russia in 6th place have 353 points. This meant that wasn’t too much of a difference between the two teams but the good showing at the tournament by the French was enough to propel them upwards. In 7th place was the biggest mover of the tournament with Serbia jumping 4 places. When you think that Serbia finished second in the tournament, it is easy to see why they made such a big move in the world rankings. They stand on 344 points, which isn’t too far behind Russia and no doubt Serbia will be hoping to rise up the rankings even further. The remaining three teams in the top had different levels of success at the tournament and Turkey will no doubt be feeling a bit disappointed with how their campaign turned out. They dropped one place in the top 10 and they now stand on 284 points. In 9th place, Brazil stands on 277 points and they actually rose one place. The fact that Brazil knocked Argentina out of the World Cup means that their fans were delighted with their showing in Spain. The fact that the 9th ranked team defeated the team in 3rd indicates that these rankings are not the be all and end all when it comes to determining how teams are playing. In 10th place were Greece and they were the biggest losers with respect to the rankings. The Greek side had an excellent return in the group stages but they slumped in the knock-out round and were back home from Spain long before their postcards would have arrived.